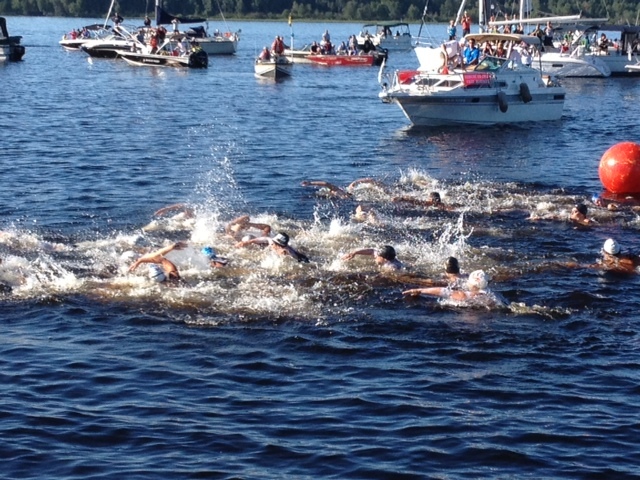 The swimmers have entered the 19 C water and have begun their 6+ hour journey to Roberval: the Traversee of Lac St. Jean, a FINA 32km open water swim has begun. 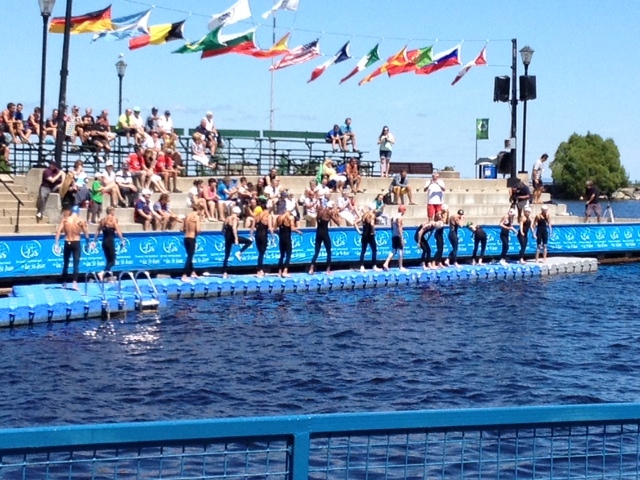 I last wrote a post about the FINA World Cup 10km event that took place two days ago at the same venue. The organizational structure, medical facilities, and WADA doping control stations are the same for the 32km Traversee. 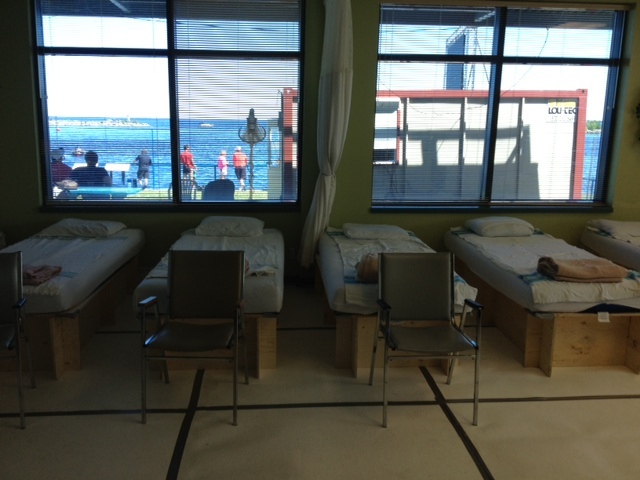 The infirmary at Traversee Headquarters. 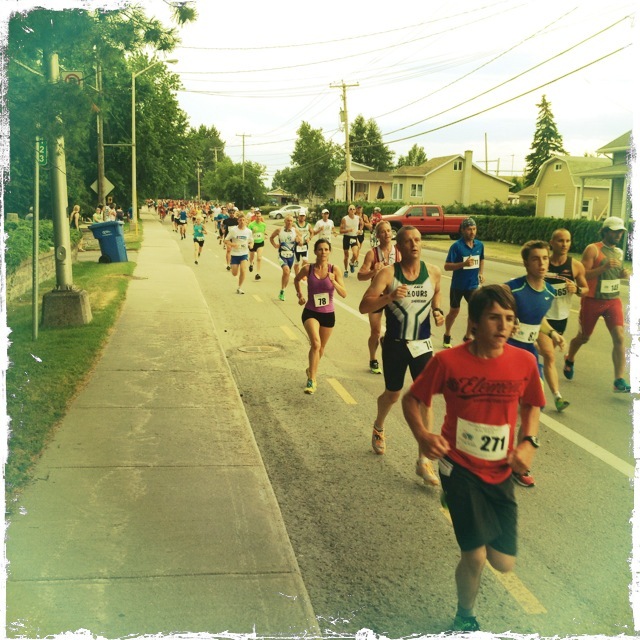 The 10km race was an exciting finish, and more importantly from the viewpoint of a sports medicine clinician, the event was safe. By that I mean that the facilities and staff were well organized, and there were no major injuries to the athletes. 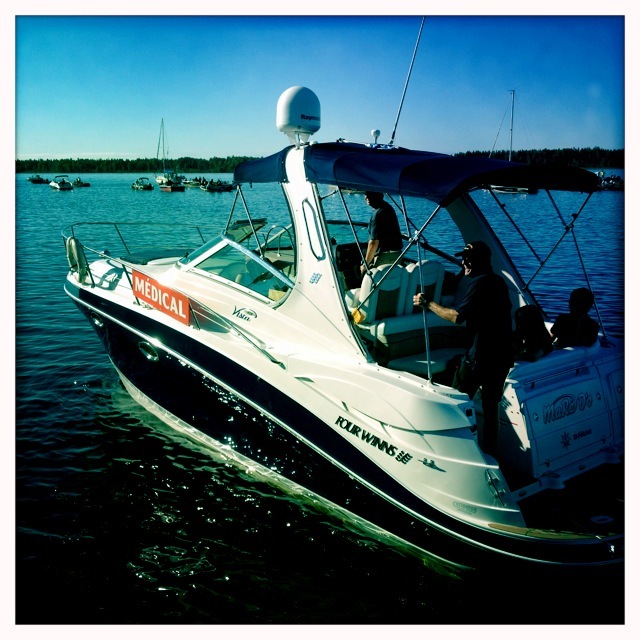 As expected, given the cold waters of the racing venue, a couple of swimmers were treated for mild hypothermia, but no one required anything more than passive warming and supportive care. Hypothermia (body temperature < 35 C) can be a concern for any athlete (coach, athletic trainer, or physician) performing in an outdoor venue, but it is a special risk for open water swimmers. FINA mandates that swims take place on courses with event-day water temperatures in a range from 16 to 31 C. At the higher end of that range, swimmers may produce more heat than can be easily dissipated through convection and conduction, and may be at risk of hyperthermia. Exertional Heat Illness is, of course, another environmental hazard sports medicine clinicians must be concerned with. It is thought to have been one of the contributing causes to the worst outcome one can conceive in the field of sports medicine: the death of an open water swimmer, Fran Crippen, occurred at a FINA event in the United Arab Emirates in 2010. At this venue in Lac St. Jean, we have the opposite concern. The early morning temperature on race day Thursday was 18 C, and I was happy to see the temperature climbed one more degree by race time. The swimmers’ opinions of those conditions ranged from neutral to notable (cold! ), but, as I said, only two swimmers needed attention. The other 15 emerged from the water with their biggest concerns ranging from 1) washing the lanolin off of their bodies to 2) producing urine for doping control. FINA has a good sports medicine reference web page and an especially good outline of the risk of hypothermia in open water swimming. The web article, authored by Dominic Lakeland and Kevin Boyd, references a study they conducted in 2007 on “Predictors of Developing Hypothermian in Open Water Swimmers.” The authors looked at 27 athletes competing in 9 open water events in the British 2007 swimming season. They took several anthropometric measuresements (age, height,weight, and 6-site skin fold thickness) as well as environmental measures (wind-speed, air and water temperature) as independent variables of interest. As dependent variables, the authors measured oral and aural water temperatures at 10, 20 and 30 minutes after the event. The height and weight could be used for BMI calculations. The six sites used for skin fold thickness in this study included the medial and lateral forearm, biceps and triceps, and suprailiac and suprascapular sites, all taken on the athlete’s dominant side. During the season, three of the 27 athletes were treated for mild hypothermia, but in all cases athletes measured aural/oral temperatures exceeded 35 C after 30 minutes and the three athletes needed only passive rewarming as an intervention. The authors found that the greatest risk factor for developing mild hypothermia was the sum of 6-site skin fold thickness). This is a small study, and one that ideally could be repeated with larger numbers and with perhaps a more accurate measurement of core body temperature: ranging from rectal thermometers/thermistors to ingestible chips. It suggests that in the sport of open-water swimming, in cold venues, having a higher percentage of body fat is protective of injury; whether it might be performance enhancing (or hindering) is something else that might be investigated. I have thoroughly enjoyed my time here in Roberval and hope to come back for future sporting events. I suspect like most of you–most of my peers in sports medicine–I got into clinical sports medicine at least in part because of my love of sport and exercise. I make my money in the clinic, but I get my greatest joy in this field being on site, with athletes, helping them through injury; helping prevent injury; helping to organize venues to maximize the health of the athletes we serve. It has been a pleasure on my time off to walk through this town and delight to see that Roberval is the epicenter of a thriving bike touring community, with a renowned 256km bike route, the Veloroute des Bleuts. It is clearly being well used; as a pedestrian in town in the summer, I suggest you keep your head up to avoid collisions! As I understand the history of the Traversee, a Martin Bedard first envisioned a 32km swim across the huge Lac St. Jean. He was a dreamer, and the idea was thought at first to be impossible. But he persevered in his vision. I wonder if he could possibly have imagined what such a quixotic vision might become? The week around the Traversee this town blossoms. There seem to be concerts and parties every night. On the night before the 10km swim, they lay out the world’s ‘longest supper table’ where 10000 people come to dine. And there are multiple athletic events, not exclusively swimming ones: earlier in the week 680+ people participated in a road run in celebration of the Traversee. 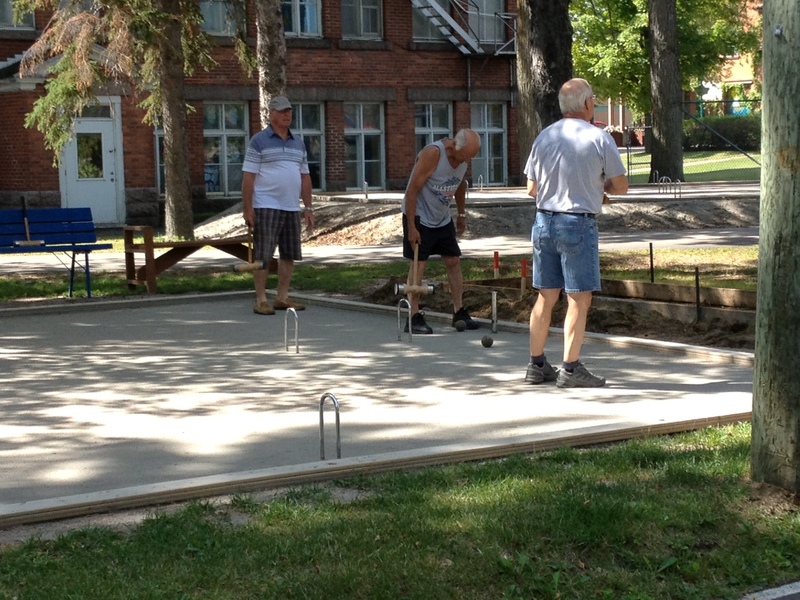 And in a corner of town, on a walk on my ‘day off,’ I caught this group of older man, playing a game of croquet, and loudly enjoying the competition. 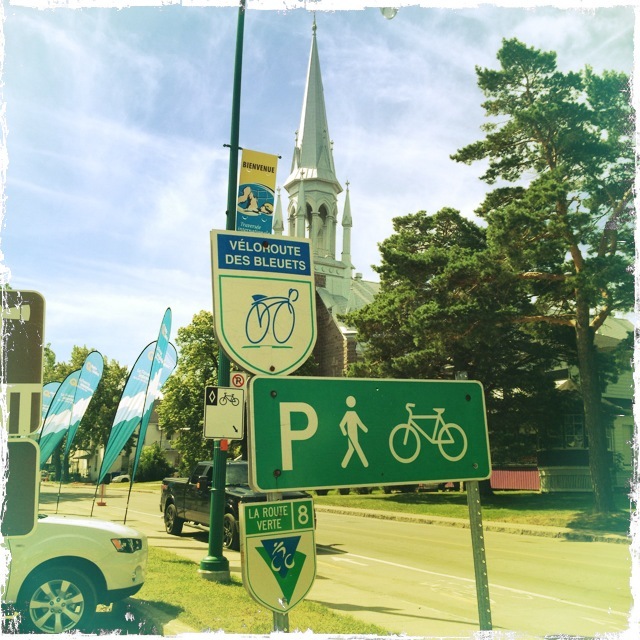 Elite swimming, to biking, to road racing, to croquet: this town has it all. Bravo, Roberval. Au revoir!